A male 33 y.o. admitted to our unit 2 weeks after a car accident (was a driver) with a femoral shaft fracture. 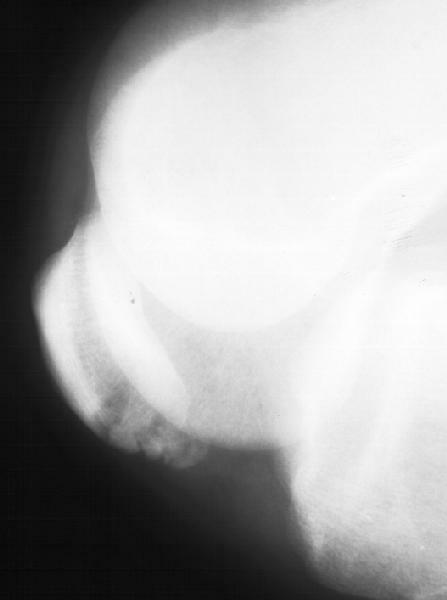 There is also a patellar fracture (see image 1). There is no swelling and hemarthrosis, and and only slight pain with intensive palpation over the site. Extensor mechanism looks preserved. The femur was nailed yesterday (UFN 12 mm). After this an xray in full flexion was performed (image 2), and i decided not to operate and left it as is. Today the patient walks with partial WB and his painless knee ROM is at least 90 degrees. Some colleagues here tell that i was wrong and the fracture requires surgical fixation. What is your opinion? If yes, what technique should be used? How to manage the patient without ORIF - weight-bearing, knee ROM exercises? Tension band wire fixation with K wires or cannulated screws would prevent separation of the fragments which can effectively lengthen the extensor mechanism and this could weaken extension, and in some, but not this case, cause articular incongruity. I would have fixed the patella prophylactically especially if I wished early motion of the knee.